Australia completed a seven-wicket win over New Zealand in Christchurch to seal a 2-0 series victory and regain top spot in the Test rankings. 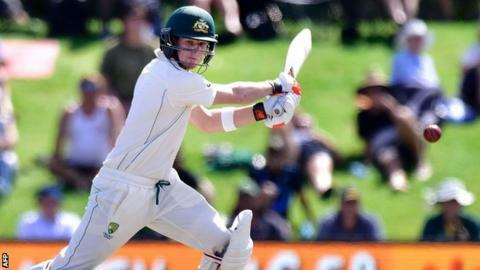 They resumed on 70-1 and skipper Steve Smith recorded his 16th Test fifty to guide his team to their target of 201 shortly after lunch on the final day. Adam Voges made 10 not out and was the leading series run-scorer with 309. New Zealand skipper Brendon McCullum bowed out of international cricket and said it was "time to move on". The 34-year-old, who leaves with 14,676 international runs, broke the record for the fastest Test century during his final match and also the highest number of Test sixes with 107. "It would be nice to be remembered as a good team man," said McCullum. "As a guy who played for the right reasons and who, if in doubt, was prepared to take the positive option. Hopefully, the guys that I've played with will remember me as a good bloke as well." Smith, whose team gave McCullum a guard of honour, said: "Brendon has been absolutely magnificent for the world of cricket." It is the first time Australia have been at the top of the Test rankings since 2014, and since being bowled out for 60 in losing to England at Trent Bridge last year they are unbeaten, winning seven of nine matches. Meanwhile, Australia fast bowler Ben Hilfenhaus has announced his retirement from first-class cricket. The 32-year-old played 27 Tests and took 99 wickets at an average of 28 apiece, plus 29 one-day international wickets in 25 matches.